It’s almost time to ring in the new year, but the weather may put a damper on the festivities. 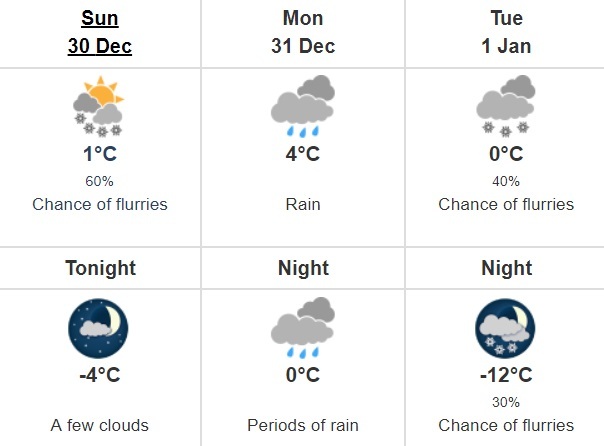 According to a recent forecast from Environment Canada, we’re in store for a rainy New Year’s Eve. Periods of rain are expected on Monday, December 31, starting in the afternoon and continuing to the evening. 30 km/h winds are also expected to develop late in the afternoon. The rain will potentially transition to flurries come Tuesday morning, marking the first snow of the new year. Thankfully, New Year’s Eve isn’t expected to be too chilly, with a low of 0 degrees Celsius on Monday night. However you’re planning to celebrate, mind the rain and have a Happy New Year!